Inamuruchi miso is the key to the authentic taste of the soup. Boil the pork (before slicing) until soft. Soak dried mushrooms in water and squeeze to remove the extra water. Save the water for later. Cut all ingredients in thin slices, the same size as konjac. Pour the water used for soaking the mushrooms together with an additional 1.5 liters of water and the two packs of dried bonito powder in a pot and bring to a boil. Take the bonito packs out after three minutes of boiling. Add the pork slices and skim off foam. Mix all ingredients and cook about 15 minutes. Last, add Inamuruchi miso to taste. 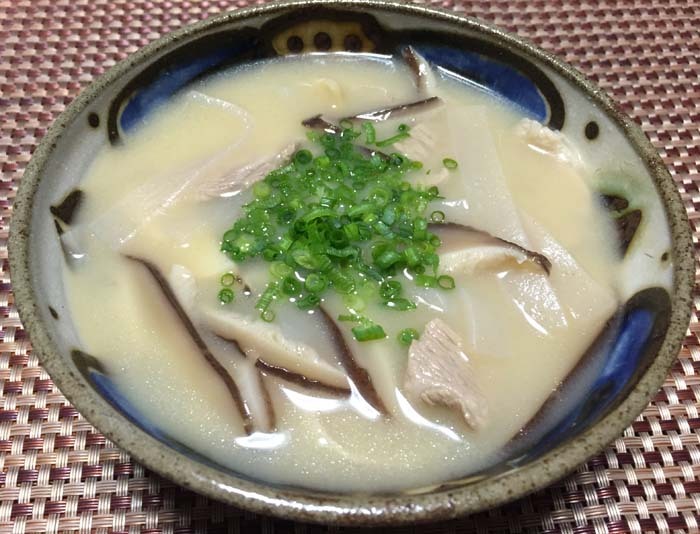 Inamuruchi is usually cooked for an anniversary or other celebrations, the same as Nakami jiru (soup). 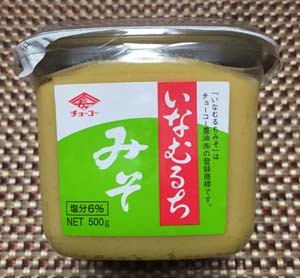 It is local Okinawan food, and therefore all grocery shops sell ingredients such as miso and konjac for Inamuruchi. Inamuruchi miso is the key to the genuine taste. Kasutera Kamaboko made from fish paste and eggs that give it the yellow color. Although regular kamaboko can be used, Kasutera Kamaboko makes the soup tastier.